In the cloud-washed airspace between the cornfields of Illinois and blue infinity, a man puts his faith in the propeller of his biplane. 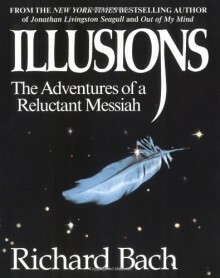 For disillusioned writer and itinerant barnstormer Richard Bach, belief is as real as a full tank of gas and sparks firing in the cylinders...until he meets Donald Shimoda--former mechanic and self-described messiah who can make wrenches fly and Richard's imagination soar....In Illusions, the unforgettable follow-up to his phenomenal bestseller Jonathan Livingston Seagull, Richard Bach takes to the air to discover the ageless truths that give our souls wings: that people don't need airplanes to soar...that even the darkest clouds have meaning once we lift ourselves above them... and that messiahs can be found in the unlikeliest places--like hay fields, one-traffic-light midwestern towns, and most of all, deep within ourselves. I remember only that it was a great, great disappointment.